Different Working Committees in one of their seat works while prepping their respective budget plan. Being the oldest leading State University in the region, the Western Mindanao State University takes a pro-active stance to carry out reforms to upgrade public higher education system in the country. 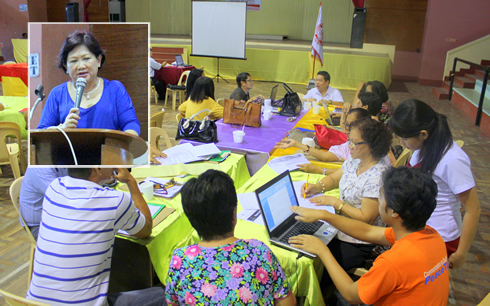 In a WMSU strategic planning summit headed by Dr. Milabel Enriquez Ho last August 13, 2012, pressing concerns needed for the improvement of SUCs (State Universities and Colleges) and LUCs (Local Universities and Colleges) were raised. Invited to the deliberation together with the University constituents were the office of the National Economic Development Authority region IX and the Zamboanga City Planning office. Thoroughly discussed in the caucus is the present move to enhance management of public tertiary education through: rationalization to improve efficiency; upgrading quality through standard evaluation; and enhancing access to quality higher education. The rationalization of public tertiary schools is a CHED mandate that calls for an aggressive move to oversee its distribution and growth to stop proliferation of non-performing HEIs. A blueprint for “amalgamation” is now being pilot tested as a restructured model of governance in some regions to allow public tertiary schools to merge as a system that would share, generate and maximize use of resources. In addition financial management in the rationalization scheme calls for improving implementation of normative financing, socialized tuition fees and asset inventory which most public HEIs have difficulty espousing for varied reasons. Duplicative programs are mandated to be phased out and priority programs identified to ensure that graduates are not lost and a sufficient workforce is available in the future. WMSU has started a few years back by phasing out and streamlining oversubscribed programs following earlier CHED directives. Actions are taken by the finance department to review payments of overload, honorarium and overtime to cut down unnecessary cost. It is now also considering the possibility of a full implementation of a socialized tuition fee as it caters to multi ethnic groupings from varied socio-economic status in the region. Upgrading quality of public Higher Education Institutions necessitates regular accreditation, monitoring and evaluation from CHED, AACUP and other recognized accrediting agencies. It also means intensification of Faculty Development Program to draw assurance of faculty professional growth in terms of their competitiveness here and abroad. Improved performance of graduates in licensure examinations in priority disciplines is another quality indicator which CHED strongly reiterates. “External benchmarking” to be at par with global standard is further encouraged through Research & Development Centers with state-of-the-art-facilities. Quality upgrading also requires accountability and regular assessment based on quantitative performance indicators for learning, teaching, research and knowledge transfer. Various colleges in the University are assessed to be in the third level of accreditation while the rest are doing initial self-appraisal in preparation for the evaluation. Furthermore, the University has been reaping good ratings in accountancy, engineering, law licensure examinations and reinforcing support for faculty scholarships. Its R & D outputs have increased boosting partnerships with highly recognized agencies like DOST, PCCARD, USAID, AUSAID, GOs and LGUs. It is networking with international linkages to establish more avenues for research endeavors including paper peer reviews. �Last October 14-19, 2012 the University research team headed Dr. Milabel E. Ho together with Dr. Chona Sarmiento, RDEC Dean and 14 other University officials visited the National Vietnam University in Ho Chi Minh City and the Build Bright University in Cambodia for a corroborative research initiative. Lastly, to enhance access to quality education Public Higher Education looks at modernizing facilities of developing SUCs and strengthening student financial assistance programs. The key is for a public academic institution to have the lobbying potential for funds from private or public sources. The WMSU student scholarship benefactors are increasing and so is the number of beneficiaries. Grants and donations for the establishment of school infrastructure including those for projects’ implementation are continuing by virtue of the University’s responsive and dynamic leadership at present.